Same video in 7 parts. 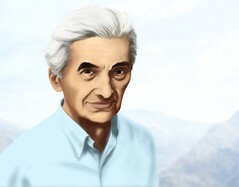 Zinn offers numerous examples of how the American government has used “divine ordination” and rationales of spreading civilization and freedom to justify its most dastardly actions: the extermination of Native Americans and takeover of their land; the annexation of Texas and war with Mexico; war against the Philippines; U.S. involvement in coups in Latin America; bloody efforts to expand U.S. influence in the Middle East, Africa and Asia. The battle against Communism, often bolstered by arguments of America’s divine mission in the world, was merely a convenient excuse to maintain U.S. economic and military interests in key regions. This entry was posted in All Posts News Politics and-or Videos, Christianity, Dandelion Salad Featured Writers, Dandelion Salad Videos, Empire, History, Imperialism, Politics, Religion and tagged American Exceptionalism, Bush-George W., Howard Zinn. Bookmark the permalink. The belief in national exceptionalism is hardly unique to Americans. It is common in many countries and cultures. What makes American exceptionalism so dangerous is that it has a huge military and economic empire backing it up.